For generations now, little boys (and girls too) have played with Matchbox cars, those miniature models of the cars and trucks that grownups drive. “My twin boys loved their Matchbox cars,” remembers Jill Jakeman of Ocean Park, echoing a sentiment heard from parents the world over. The Jakeman boys, Jeffrey and Jonathan, would have celebrated their 55th birthdays in February 2013, and their mother recently uncovered their childhood collection of Matchbox cars, still in their original carrying cases and virtually untouched since the 1960s. Sadly, both boys passed away at an early age, when Muscular Dystrophy claimed their lives at ages 20 and 21 respectively in the late 1970s. To honor their memory and celebrate America’s love affair with Matchbox cars, Jakeman and her husband Del generously donated the collection presented here. Jakeman also shared photos of Jeffrey and Jonathan as fourth graders at the Jameson School, taken in 1967 the same time the boys were collecting toy cars. Matchbox toy cars first appeared in Great Britain in 1953, when a British company called Lesney Products crafted a miniature version of Queen Elizabeth’s coronation coach. The coach was an instant success, but it was much larger than today’s Matchbox cars. The story goes that Lesney co-owner Jack Odell had a daughter and her school only allowed students to bring in toys small enough to fit into a match-box. Odell took the school at its word and designed small toy trucks and created packaging that looked like a match-box. 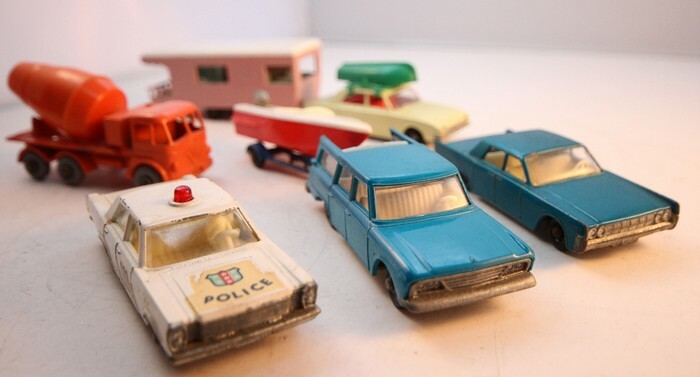 Priced affordably, sales of Matchbox toys soared and soon the cars were as popular in America as they were in the U.K.